As your trusted personal stylist and shopping editor, I am constantly scouring London’s best stores and the internet's best fashion sites to source the most desirable, functional, bound-to-sell-out items for my clients and myself. And the good thing is that these items are often also ridiculously affordable so it would be rude not to share! Here is what you will find in my wardrobe and the wardrobe of my clients. I love jackets. No matter what your profession or lifestyle a jacket is endlessly versatile - worn over a dress for work, with a t-shirt and converse or backless loafers for the weekend and can be worn day or night. Whether your staple is a leather jacket or something more tailored, a jacket is a dependable piece that is worth investing in. Blazé Milano are the Rolls Royce of blazers and I have this one on my wishlist. Massimo Dutti on the highstreet does incredible jackets. Statement earrings are the easiest (and sexiest) way to add interest to your outfits. Keep a few pairs in your draw at work and transform your work look from day to night. I love Rebecca De Ravenel's earrings, they are light, simple design but maximum impact. The one thing that my clients have in common is that they all struggle with shoes; whether it is foot problems, finding work appropriate options or what shoe to wear with what. I'm always on the look out for good looking walkable shoes and I love these from Sam Edelman. The green is a great season update and will work with jeans or work trousers and dresses. Using the right hangers will not only allow you to fit twice as many items in, but they also protect your clothes and give your wardrobe that boutique look. There are three types of hangers you need for your wardrobe; non-slip hangers, clip hangers and open-ended trouser hangers. For heavy coats opt for wider wooden hangers and knitwear should be folded neatly. Super thin and non-slip these hangers will also give you wardrobe that uniform look - like a boutique in your own home. 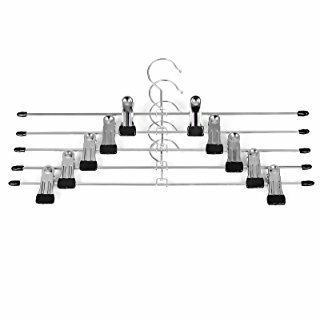 The hooks can be rotated to maintain a uniform look when hanging in your wardrobe. The rubber coated clips can be adjusted to fit your needs and importantly won't mark you clothes. The hooks can be rotated to maintain a uniform look when hanging in your wardrobe. You can also hang them vertically to save space with out of season items. Your trousers and jeans will be easily accessible on these non-slip metal hangers. And the black and silver keeps your wardrobe looking uniform. My clients always want advice on how to get rid of moths. Without investing a lot of money in dry cleaning or fumigation, it is possible to keep moths at bay. These moth traps are not the most humane of options but you will see results! Moths are attracted to sweat and left over food on garments. Be sure to wash your clothes after every wear, especially if you have kids. Use these sachets to repell moths and create a lovely scent. 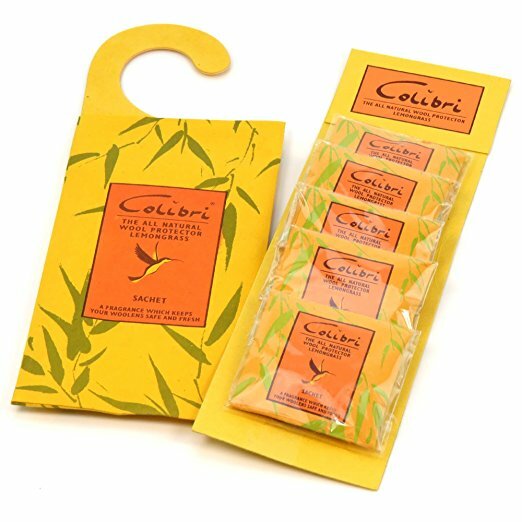 I love Colibri sachets as they are all natural and packaged in eco-friendly rice paper. I love Ecozone products and their use of plant based ingredients that are kind to us and the environment. The Ecozone Moth Repellent creates a long lasting protective barrier against moths using a complex blend of natural essential oils and you only need to spray every two months. Take care of your knitwear and remove bobbles from your cashmere and wool jumper and coats. Your old favourites will look like new again. There are cheaper versions available but the quality of the parts means that you won't put a hole in your jumper. This is a lint remover, clothes brush and shoe horn in one. Perfect for removing pet hair or dust from out of season clothes and it is light enough to travel with. I love The Laundress Wool and cashmere shampoo but when you are wearing knitwear every day in the colder months it can be a costly option. Woolite is my everyday choice. It always delivers great results and stops the fibres going flat like some other delicate washing products. Wash your garments inside out to protect the fibres from pilling. I use this to wash my silks too. I take great care in choosing the right colour and wash for my clients denim and they investment a lot of money in jeans so it's devastating when over time the colour changes and fades with washing. This genius product from Mr Black is formulated to keep the original colour intensity of your denim whilst still cleaning them thoroughly. Always wash them inside out and never put them in the dryer. There is nothing like a box fresh pair of white trainers and if you prefer to keep them that way then Jason Markk's shoe cleaning kit is a wonder. Don't forget to take out the laces and give them a wash too. I also love Jason Markk cleaning wipes for on-the-go spot cleaning. The cost and inconvenience of cleaning leather can turn my clients off investing in expensive pieces. This leather cleaner is easy to use and will keep your investment pieces looking new. Use on your jackets, leather trousers, shoes and even your leather sofas. Remember to protect your leather and suede pieces before you wear them. It is always preferable to store out-of-season clothes in breathable fabrics but it all depends on the space you have. These are invaluable for those with limited wardrobe or storage space. At the end of the season wash everything before storing them in the bags with moth repellant sachets. If you have open shelves or are storing clothes on top of your wardrobe where they are visible, opting for a beautiful storage boxes will keep your room looking uniform and boutique like. Once your items are washed, store them with moth repellant sachets inside an appropriate sized box. If you are not limited on space, cotton storage bags that allow the fabrics to breathe keep your clothes in good condition. These are strong and easy to use and I love the clear window so you can see the contents inside. These are also great for storing bedding and linens. Ever wondered how shops keep their clothes so neatly folded? This Brabantia folding board complete with instructional illustrations will keep your wardrobe looking like a boutique. I take this with me to all my wardrobe consultations and it is always a bit hit with my clients. This is one of those items you don't think you need until you have one. It is perfect for planning your holiday wardrobe or putting together new outfit combinations and when editing your wardrobe. Place all the items you love on the rail and consider whether to keep the remainging items left in your wardrobe. If you want to protect your delicate clothes from dust then store them in breathable cloth storage bags. DON'T be tempted to leave your clothes in the plastic covers when they come back from the dry cleaners. Fabric need to breath and the plastic attracts dust and dust attracts moths. Use the clear sleeve on the front to label the contents.